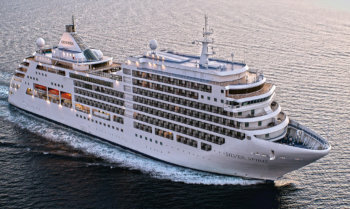 View all Silver Spirit cruises or view more options for Silversea cruises. Personal training, body composition analysis and specialty classes at the Fitness Centre are available at an additional charge. The ideal place for scenic days at sea whether cruising New Zealands fiords or traversing the Panama Canal, this vantage point far forward and high atop this luxury cruise ship is perfect for that king of the world feeling. Relax, rejuvenate and renew all your senses. At 8,300 square feet, The Spa on board this luxury cruise ship is a sanctuary of pure bliss, featuring floor-to ceiling windows, nine treatment rooms, indoor/outdoor relaxation areas, and an outdoor whirlpool. Indulge in a wide range of invigorating therapies including facials, body wraps and massages. The ceramic-tiled Thermal Suite is an exclusive spa area furnished with heated lounge chairs. With its connecting private Hammam (Turkish bath) Chamber, The Spa serves as the setting for the Private Hammam Experience, one of several unique Silver Spirit luxury cruise ship treatments. Appointments for spa services may be made on board the ship, or in advance via My Silversea. Men’s and women’s saunas and steam rooms are perfect for relaxing before your spa treatment or after your workout. And an outdoor relaxation area offers bar service so you can enjoy a complimentary fruit smoothie, champagne or cocktail while soaking in the expansive spa whirlpool. Applaud a broad spectrum of entertainment – from full-scale production shows and classical soloists, to cultural entertainment and feature films. Throughout your voyage, the Show Lounge also presents port talks, enrichment lectures and a variety of special events. Sparkling with silver, crystal and candlelight, this luxury cruise ship’s main dining room serves contemporary, international cuisine with sophisticated elegance and impeccable service. Menus feature regional specialities unique to the voyage destination, for example, Roasted Chilean Sea Bass while cruising the Chilean fjords and Indian Chicken Korma en route to Mumbai. During days at sea aboard your top line cruise, choose something from La Collection du Monde, a series of signature dishes created exclusively for Silversea by the Grands Chefs Relais & Châteaux. *Per guest reservation fee of US$40. Please visit My Silversea to make your reservations. As the stars begin to peek out from a darkening sky, the top deck of the Pool Bar & Grill is transformed into The Grill – an intimate al fresco eatery featuring a fun, interactive Black Rock Grill experience. A preheated volcanic rock is brought to your table, allowing you to cook such delicacies as steak, veal, pork, lamb, salmon, fish or prawns exactly to your liking right at your own table. And what a table it is. A white linen tablecloth laden with delectable morsels, and every seat with an unmatched ocean view while you cruise. Innovative Asian fusion cuisine, Kobe beef and spider lobster vie for the attention of your tastebuds in this cosy, stylish venue aboard this luxury cruise ship. Seishin features a large, round chef’s table as its centrepiece. Settle in to the surrounding tables and watch the chef at work sculpting fresh sushi and sashimi, characteristic of a luxury cruise. The varied menu ranges from exquisite bento (boxed meal) lunches and a la carte specialities to a nine-course degustation dinner. The Art Deco-inspired decor of this dining venue aboard the Silver Spirit luxury cruise ship, elegantly recalls the supper clubs of the 1930s. Trendsetting menus offer a modern twist, showcasing regional and seasonal delicacies of the cruise destination to be enjoyed in a succession of small courses. Arrive early for cocktails and stay late as the mood is transformed by live music, dancing and nightclub-style entertainment. On board this luxury cruise ship, a divine selection of Italy’s best cuisine is served a la carte in La Terrazza. Authentic recipes and the freshest ingredients come together with flair and passion – a flavourful expression of Silverseas distinctive Italian heritage. La Terrazza is open for casual, buffet-style breakfast and lunch with indoor or al fresco dining on the outdoor terrace. During the evening, La Terrazza transforms into an a la carte traditional Italian restaurant.